Last year, after visiting New Delhi’s National museum, I wrote a series of articles about antique objects displayed in the museum, from parts of the ancient silk route ( presently in Xinjiang province of China), which were collected by one of great explorers of last century, Sir Aurel Stein. In one of the articles, I had written about an exceptionally bright painting done on the dado of a wall, along the northern circular passage of a shrine, at a place called ‘Miran’. Sometime back, a reader, after reading my post , inquired with me about another picture painted on the same wall and supposed to be displayed in Delhi museum. Since I had not seen that painting, I was rather curious and requested her to send me a copy of the painting by mail. This painting is rather unusual as it shows a men carrying a huge garland of flowers of a wavy kind of construction. 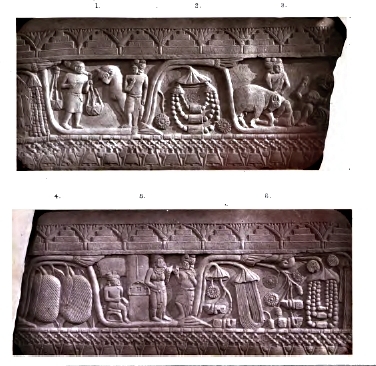 The reader also had mentioned to me, that a similar type of bass relief showing similar wavy garland and bearers, which was supposedly to be from Gandhar kingdom (present location Pakistan, around Peshawar city), is displayed in the Musee Guimet,Paris. Needless to say that I got very much interested in this curious wavy garland and it’s bearers. I carried out a search for similar garlands and garland bearers on the net. To my surprise, I found that almost all major museums had similar ‘garland bearers carrying a garland’ bass relief panels in their exhibits. Even many private collections boasted of ‘garland bearers with that wavy garland design’ panels. It was obvious that this was a very popular motif and was not something unique or extra ordinarily exquisite. The Miran wall paintings are supposedly from 3rd or 4th century. 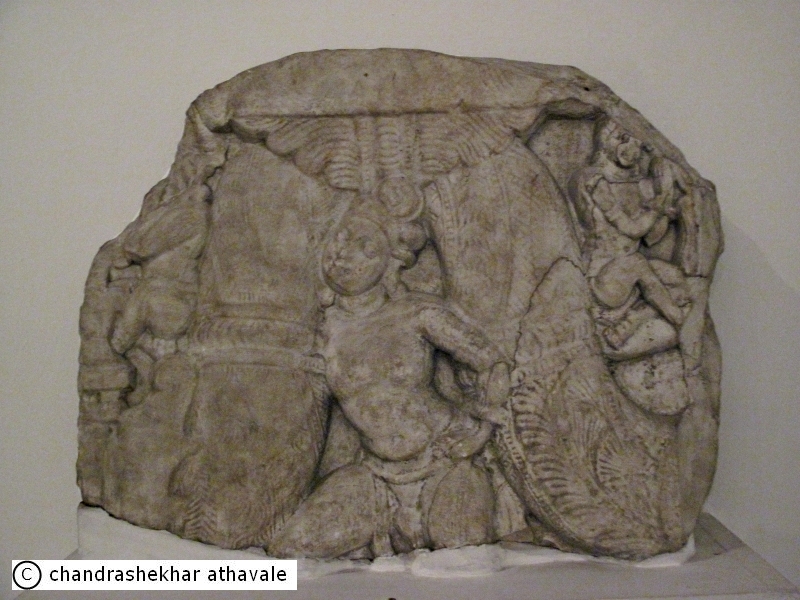 Most of the Gandhar bass reliefs are from 2nd or 3rd century. Obviously this was a popular motif of that period. Amarawati is a small town near east cost of India. This town from Guntur district of Andhra Pradesh state of India, is located on the southern bank of the mighty Krishna river. Little south of this town a splendid Stupa was discovered at the end of eighteenth century. This stupa consisted of a solid dome of 148 feet dimeter on a pedestal or a base. A stone railing of 192 feet diameter was constructed around the central stupa. This outer railing consisted of 9 feet high upright stone pillars supported by round cross bars. The railing was crowned by a 2 feet high coping rounded at the top. Besides this, the central dome also had two rings of copings. These were much smaller in height. The outer face of the outer rail coping was carved with a continuous garland carried on the shoulders of young men, sometimes accompanied by women. The loops of the garland were filled with various motifs. One of the smaller copings also had similar continuous garland carried by dwarfs. It is generally believed that the construction of the stupa was done sometimes between beginning of second century to 3rd century. 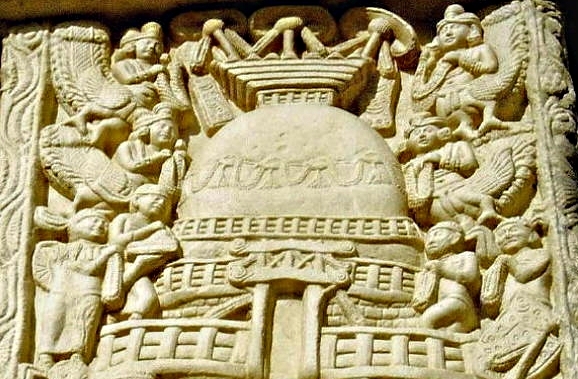 The continuous garland pattern around the complete outer rail and dome of the stupa explains, why so many of these relief panels with garland designs have been found in Gandhara, as there must have many stupas and each one had a coping with carved panels of garlands. 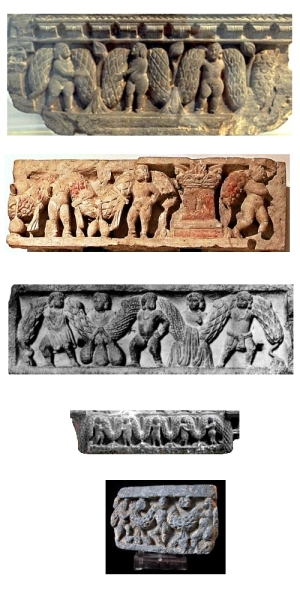 Since each stupa had number of these panels used in the coping, the total number of available panels in ruins from this region was bound to be a big number. This explains why so many of these carved panels are found all over the world museums. The most surprising fact however is that three places, one near the Hindu Kush mountains, one place in south India at a distance of 1330 miles from it, and a third place deep inside China, again at a distance of 1029 miles from it, had similar garland motifs on the religious shrines there. 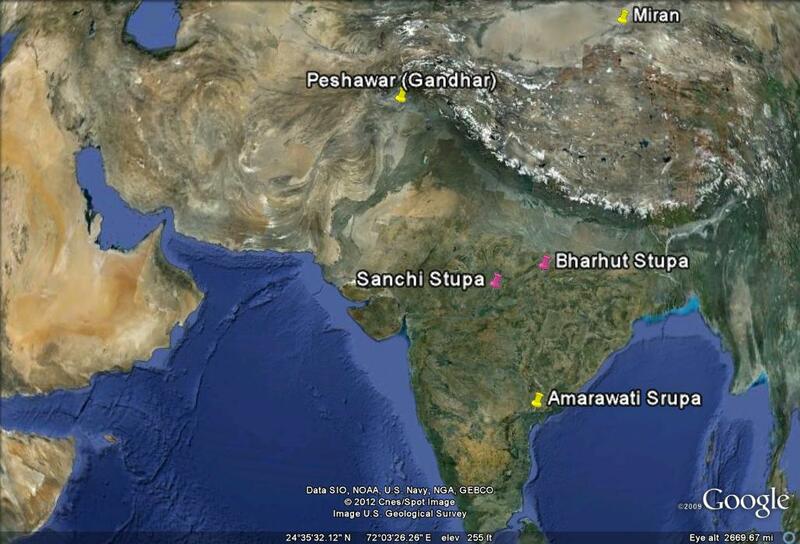 There were two or three major stupas in India at the turn of the first millennium. The one at Bharhut was supposed to be constructed between 250 to 200 BC and has a very similar construction as Amarawati stupa. It is interesting to note that rail coping in this stupa does not carry garland design at all, but shows a purely Indian, lotus stem pattern. Similarly stupa at Sanchi, constructed sometime during first century AD, also does not carry any continuous garland designs. 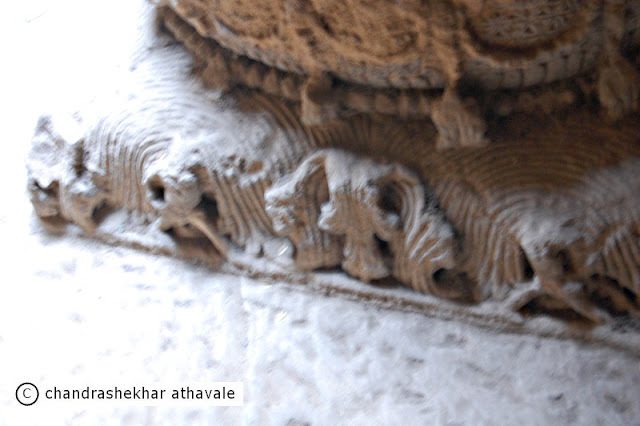 At both these places, small figurines do appear on pillar carvings, carrying garlands, but there is no continuous garland design. Another curious but well known observation is that both Sanchi and Bharhut stupas were constructed during Hinayana phase of Buddhism in India and do not show Buddha in human form anywhere. 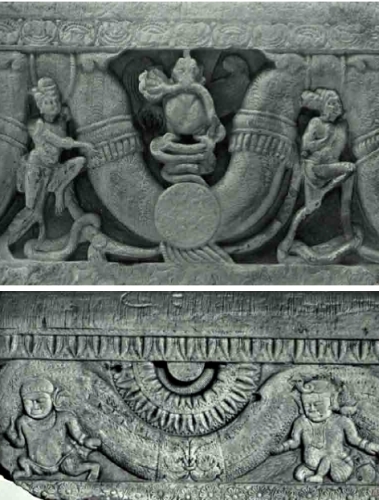 It is obvious from this discussion that the continuous garland motif was used in Gandhara sometimes during second century and the motif was well accepted by the Mahayana school and its use spread widely all over India and China. “ the interaction of Greek and Buddhist culture flourished in the area of Gandhara, in today’s northern Pakistan, before spreading further into India, influencing the art of Mathura, and then the Hindu art of the Gupta empire, which was to extend to the rest of South-East Asia. The influence of Greco-Buddhist art also spread northward towards Central Asia, strongly affecting the art of the Tarim Basin, and ultimately the arts of China, Korea, and Japan. In New York’s Metropolitan Museum of art, there is an exhibit, the citation for which reads as “ Marble sarcophagus with garlands and the myth of Theseus and Ariadne [Roman, Hadrianic or early Antonine] .” Now a sarcophagus in simple English means a coffin. It appears that the garland with cupids motif was so popular with Greeks and Romans, that it was used even on a coffin. Finally a word about the cupids. Though Gandhara engravers used the naked figurines of cupid on the bass reliefs, it probably was not palatable in Tarim basin of China and in south India. Cupids therefore took form of dwarfs and ordinary men and women. Few months back, I visited Buddhist caves in the city of Junagadh; Gujarat state of India. These caves are supposed to be dug at the beginning of the first Millinium. The caves are decorated with beautifully carved supporting pillars. At the bottom of the pillars, just near the bottom rung, I noticed faint traces of a wavy design. On careful scrutiny, I realised that it was the famous design of garland bearers. I was quite astonished to see that design here, because this meant that this part of the cave was dug obvuiously much later, probably in second century CE. The flower garland motif became popular when Mahayana school of Buddhism became prevalent in India. The Avatamsaka Sūtra (Sanskrit: महावैपुल्यबुद्धावतंसकसूत्र >Mahāvaipulya Buddhāvatamsaka Sūtra) is one of the most influential Mahayana sutras of East Asian Buddhism. The title is rendered in English as Flower Garland Sutra, Flower Adornment Sutra, or Flower Ornament Scripture. Is this the reason for the garland motif, picked up from Greco-Romans, to become popular, over such a large area where Buddhism was practiced? No one would know for sure.